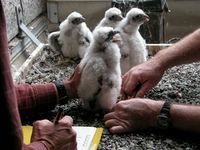 The little falcons are exploring the PG&E ledge, so they are often out of sight now. Apparently there also is a falcon nest on the Kodak building in Rochester, New York. I don't see the little one who hatched yesterday, but I think the mama is still watching over the other eggs. I'm not feeling so good, so I made tomato-chickpea soup. Easy to make and comforting to eat. Over the weekend the PG&E falcon eyases were pretty amusing, walking all over the place, stretching their wings, being fed by the parent ... but for two days now out of view of the camera. Not as fun to watch the empty nest. The Kodak falcon might be a good substitute -- thanks for sharing. Sorry 'bout your sniffles and hope you feel better soon. You, and the ailing Giants as well.